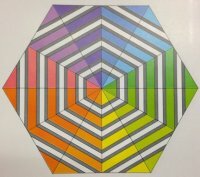 Blue Hen Quilt Shop Challenge winner announced and Class blast! Blue Hen is happy to announce the winner of our Stitcher's Garden Challenge. It is Jean Schulze with her beautiful dresden quilt! She is the lucky and talented winner of a $100 gift certificate to the shop! 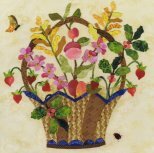 Many thanks to all the quilters who took up the challenge and created a wonderful quilt or bag or tote for us to enjoy this past month. All of the entries were fantastic! We will do this again next year - can't wait to see what you can create! Pattern required. Kits available! Whether you love to paper-piece or have no idea where to start, this club is for you. 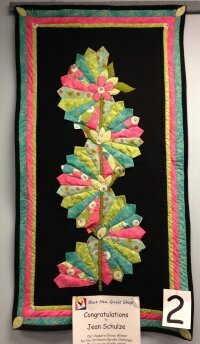 Join us to learn the ins and outs of creating intricate blocks with foundation sewing. We are starting on block 4 of the Arcadia pattern in April. 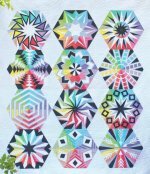 Each block is 18" tall when finished and can be used on it own as a pillow or wall hanging or make all 12 for the entire quilt!